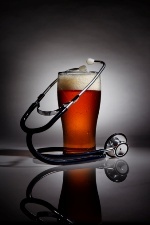 Home » Heart Health » Can Beer Protect Your Heart? Can Beer Protect Your Heart? It’s well-known by now that red wine, when consumed in moderate amounts, can have a beneficial effect on your heart. But what about beer? Does drinking beer have any benefits? Beer is an extremely popular beverage worldwide. Certainly here in North America, drinking beer is more popular than drinking wine, due to beer’s relative affordability. Let’s take a look at the stats for a moment. Red wine contains a number of polyphenols. Included in this group are flavonoids such as anthocyanins and tannins. Red wine also contains non-flavonoids such as cinnamates, gallic acid, and the well-known resveratrol. These compounds work together to act as potent antioxidants. Scientific studies have linked red wine consumption to lowering LDL cholesterol, acting as anti-inflammatory agents, and preventing the growth of cancerous tumors. Beer, too, contains polyphenols—albeit not quite as many as red wine. Studies have shown that drinking beer—in moderation—could lower your risk for cardiovascular disease, hypertension, diabetes, and cancer—similar to the effects of drinking wine. So drinking beer or wine, when consumed moderately (think one to two glasses per day), have health benefits to impart. It’s true that red wine is superior in polyphenol content due to the fact that wine is partially made from the skins of grapes where the concentration of antioxidants are highest. But don’t dismiss beer as mere junk food. Beer that is well-crafted is rich in carbohydrates, amino acids, minerals, vitamins, and polyphenols. Beer’s polyphenols mainly come from the presence of “hop” or malt—two of the raw ingredients that go into making the beverage (about 30% come from hop, with 70% to 80% originating from malt). The health benefits of drinking beer or wine stem from the overall mix of antioxidants, vitamins, minerals, and other substances. These ingredients work together to produce multifaceted protective effects inside your body. And while consuming too much of both these drinks could be detrimental to your health, having a glass of wine a day or drinking beer in moderation should give you an extra dose of their unique nutrients. Arranz, S., et al., “Wine, Beer, Alcohol and Polyphenols on Cardiovascular Disease and Cancer,” Nutrients. July 2012; 4(7): 759-81.